Johnny Ruffin reached into his wallet and pulled out $35, raising the wrinkled bills up toward a flock of chirping seagulls gliding above, defiantly displaying most of the money he had to his name for anyone to see. About 10 minutes earlier, Ruffin explained his financial plight to a Milwaukee Municipal Court judge who had none of it, telling him that he must pay $120, the last of the $1,200 in fines and fees that he had amassed over the last decade for various minor traffic and drug offenses. The 35-year-old black man is no saint. But the two-time felon has been trying to make amends by working a full-time job at a gun factory and routinely making payments to the court system to avoid jail time, despite claiming that the amount he was told he still owed is inaccurate. Ruffin’s situation is emblematic of the financial entanglement many poor black men have gotten themselves into with the city’s municipal judicial system, according to local experts who say the system criminalizes poverty by levying monetary penalties, driver’s license suspensions and ultimately jail time on defendants who do not have the means to pay their citations. “This is a part of the cycle of poverty,” said John Pawasarat, director of the Employment and Training Institute at the University of Wisconsin-Milwaukee. “It’s a pretty irresponsible way to do business if you’re a public body dealing with the citizens in your city. These people are on the fringe and this is the last thing they need,” said Pawasarat, who focuses his efforts on how driver’s license suspensions affect a defendant’s ability to keep a job. Despite the rampant poverty that grips Milwaukee’s inner city, citations that carry a relatively hefty fine are one of the city’s methods of choice to punish offenders for non-criminal infractions. For instance, a disorderly conduct citation carries a fine of at least $200, which could amount to two-thirds of a weekly pay check for an individual who earns $7.25 an hour, the minimum wage for a full-time job. Defendants who are found guilty must pay a fine or face a suspended driver’s license or jail time. According to court data obtained by NNS through an open records request, the Milwaukee Police Department writes a disproportionate number of citations in some of the city’s poorest areas. Although only 12 percent of Milwaukee residents live in two of the city’s poorest ZIP codes (53206 on the North Side and 53204 on the South Side), people in those ZIP codes received 17 percent of the 430,000 tickets written from 2011 to 2014. A typical day at the Milwaukee Municipal Court, 951 N. James Lovell St., begins at about 8 a.m. when dozens of defendants fill a dingy elevator at the Milwaukee Police headquarters building to travel up to the courtrooms. Once on the second floor, they file through a security checkpoint, where they place their metal items into a plastic bin and walk through a metal detector. Past security, defendants stand in an orderly line that forms at the service window, where clerks help them navigate through the court process. Some ask for directions. Others inquire about their case. Several just pay their fines quietly and leave the building. “I left my paperwork on the bus. It isn’t my day, but I have learned my lesson,” a chatty thin man told a clerk as he paid a portion of his fine. Others sit and wait for their turn in court, casually flipping through paperwork or the newspaper. Some glance at the clock or text on their cell phones. They mingle with strangers and watch over their children in tow. Eventually, a woman’s voice over an intercom begins calling names of defendants and directing them to one of three courtrooms. There they watch another clock and wait for a bailiff to call them to the front to discuss their case with a judge. “I need to get to work. Where’s the judge? I can’t lose my job,” proclaimed a middle-age man toward an unsympathetic bailiff during a recent court session. Moments later those assembled in the Branch 2 courtroom rise to their feet as Judge Derek Mosley strolls in and takes his seat in front and high above the court. For several hours, he and two other judges work their way through a long docket of cases, hearing the constant drumbeat of financial despair on the part of many defendants. With this in mind, judges try to incentivize employment by waiving fines for defendants who come back to court with proof that they got a job or enrolled in school. Some violations directly involve victims, such as assault and theft, while others are victimless crimes such as littering and loitering. Mosley said he tries to strike a fine balance between fairness for poor defendants and justice for victims, many of whom are also poor and minority. Even if defendants do not plan to fight their cases, Mosley implores them to come to court, where they can make arrangements to pay their obligations and where he can reduce fines and demerit points, which are assessed when drivers break traffic laws and could eventually lead to a suspended license. “Even if you don’t have the money to pay, come to court. Good things will happen,” Mosley said. He said, however, that defendants typically fear the court system and believe that if they show up, they will be taken into custody if they have a municipal warrant against them. “We have a policy in municipal court that if you walk in, you will walk out,” Mosley said, noting that judges will lift all warrants against individuals if they pay $20 toward their fines, regardless of how much they owe. But some defendants who do come to court continue to cycle through the system, seeing no end in sight to the financial burden their infractions have placed on them. “I’m trying to get back on my feet,” Mark Lewis told a judge, who informed him that he owed $531 for a variety of citations. “I have no money to pay that, honestly… even partial payments kill me,” Lewis said when the judge asked if he had $20 to pay. “I don’t have any money on me… I’m asking you to trust me… you got my word. I have just enough money until I get paid,” he said before leaving the court without paying a dime, running the risk of eventually being jailed. Sometimes defendants end up in court because they’ve had to make a tough choice. Take, for instance, Walter Luckett, 50, who tries to make a living by doing small maintenance jobs around the city. He knew the risk he was taking by driving without insurance or vehicle registration. “I needed the $75 to feed my family,” he said, explaining why he did not renew his registration for $75. When police stopped him at the corner of Sherman Boulevard and Wright Street on April 24 Luckett was fined $75 for driving an unregistered vehicle and $50 for not having insurance. Luckett said that while the fines hurt, the judicial system is a needed component of a civilized society. “You got to obey the rules. You can’t have all of these unregistered vehicles around here… society makes rules and regulations. If you don’t go by the rules and regulations, this would be like a war zone. It would be like the wild, wild west,” he said leaving court after paying his fine. Police and local lawmakers have begun to address some of the city’s citation practices for minor, nonviolent infractions. Police officials have said they’ve made a concerted effort not to ticket for minor traffic offenses over the last few years, decreasing the overall number of tickets written by 46 percent from 2011 to 2014. In addition, the Milwaukee Common Council in June significantly slashed the fine for possessing a small amount of marijuana. The intersection between race, poverty and the local judicial system has been a concern of the Justice Initiatives Institute, a local nonprofit organization, which recently published a report examining defendants who were jailed after they failed to appear in court and pay their fines. 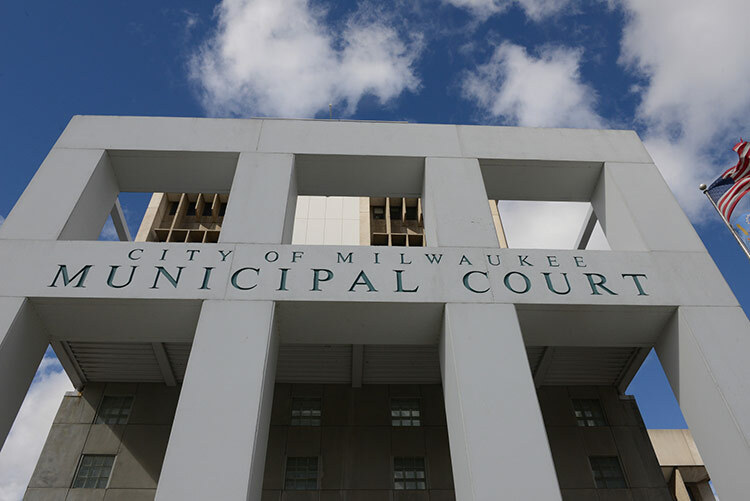 The report examined the economic and demographic characteristics of defendants processed through Branch A, a courtroom in the county jail separate from the main court facility in the Milwaukee Police Department, from 2008 to 2013. It studied 26,000 defendants, most of whom were arrested on a municipal warrant after not paying a citation and spending two or three days in jail on each occasion, earning time served, which reduces the amount of money owed for a fine. The study found about 85 percent never paid anything on their citations; about two-thirds of those jailed did not have a job. Of those who were employed, 40 percent worked low-paying jobs. Black men had seven times as many cases associated with citations as white men. “The trends in the unemployment rates in Milwaukee mirrored the trends in how people were appearing in our study. When the unemployment rates went up, the number of people in our study (who were taken into custody) was going up. So it’s linked to poverty,” said Marilyn Walczak a project coordinator at the Justice Initiatives Institute, who wrote the report with Pawasarat. According to court officials, the city’s jailing policy changed in May 2012. Before the change, defendants for the most part were eligible to be released on a recognizance (signature) bond when the first warrant was issued for not paying their fines. When subsequent warrants were issued, they were held until they paid a cash bond. Now defendants are eligible for a signature bond the first three times they are taken into custody on a warrant for not paying their fines. Walczak noted the policy change does not mean that more defendants are paying their fines, just that police are instructed not to jail them on the first three warrants associated with municipal citations. The practice of jailing defendants for failure to pay fines is costly. The city spent more than $10 million to jail the 26,000 defendants for not paying about $5.7 million they owed from 2008 to 2013, according to the report. The court itself earns a profit each year, according to a cost-benefit document drafted by the city’s budget office in November 2014. The document showed that the court earned a net of between $1.5 and $2.8 million each year from 2009 to 2013, although that does not take into account several direct and indirect costs such as expenses associated with paying for collections, bailiffs and city attorneys. “Our revenue goes into the city’s general fund,” Islo said, noting that the money from citations helps fund city departments that do not generate revenue on their own. The city’s Judiciary and Legislation Committee recently passed a resolution asking for the State of Wisconsin to allow the city to apply a surcharge on each municipal fine. The funds would pay to store data from police-worn body cameras, which officials expect to cost $1.7 million. “The people you are taking the money from… very often do not have the financial resources to pay their fines,” said Chris Ahmuty, executive director of the American Civil Liberties Union of Wisconsin, during the committee meeting. State law allows for defendants to apply for an indigence determination and makes available community service and alternative sanctions rather than monetary penalties to those who cannot pay. But very few defendants take advantage of these alternatives. In the impoverished 53206 ZIP code, only 723 defendants who received 41,900 citations from 2011 to 2014 were offered and agreed to alternative sanctions, according to court data obtained by NNS through an open records request. “I have seen instances in Milwaukee where people are not advised and … no effort is made to communicate with them about their ability to pay or alternatives [available] to them if they can’t pay,” said James Gramling, a former Milwaukee Municipal Court judge who helped rewrite the municipal court law in Wisconsin in 2009. Another sign that defendants do not know their rights is that only 994 of 434,463 citations written (.23 percent) were adjudicated in a court trial from 2011 to 2014. Part of the reason for this may be the wording on the citation itself, according to Walczak. The citation doesn’t make it clear that defendants have the right to appear to contest the charge against them, added Walczak, who said that the local judicial process needs more transparency and explanation. Walczak also blames the fact that there is no online form designated solely for defendants who want to apply for an indigence determination. There is a form to apply to make installment payments. In addition, an informational pamphlet available in court makes no mention of alternative sanctions for people who are indigent, although a third of the city’s residents live in poverty. Free schools, non-profits everywhere, easier admissions to higher education, government aid up the wazoo (you are welcome for that, by the way). None of that has helped. Maybe rather than blaming everyone but themselves, they should look into their collective mirrors. But no, they are the victims of an unjust system. Or maybe thats just me not being empathetic. I wonder how you can possibly know the life story of every single person experiencing debilitating fines? They are all just crybabies who refuse to take responsibility for their actions? Not a single one is being treated unfairly due to a minor traffic offense? And are you saying free schools and plentiful government aid means that black people only have themselves to blame if they face fines they can’t pay? You come across like a caricature of a heartless and clueless right-wing a*&hole. Is that who you are, or do you just play one on the web? Fine amounts should be based on an individuals income. I do not find any solace in the fact that police have “said they’ve made a concerted effort not to ticket for minor traffic offenses over the last few years”. I think that we need the police to enforce the laws that are meant to keep the population safe. Speeding through residential zones, not yielding to pedestrians, disorderly conduct, etc… Regardless of race, everyone should be ticketed for these offences. The issue is in the one size fits all fine amount. A $200 fine can range from 50% of someones weekly take home pay to 1%. By linking we fine amounts to someones income we can create a penal system that targets all fairly. I can’t help wonder too if the traffic violations you mention Ryan are leading to a similar amount of tickets in all parts of the county, or just certain areas. I live in Glendale, and people are committing those violations all the time. Speeding is a serious problem and I never see people pulled over where we live or the surrounding areas. Reckless driving occurs all the time. Not yielding to pedestrians is rampant (especially near Bayshore and along areas like Silver Spring Dr.). I hardly ever see anyone pulled over in the north shore burbs though. The ideal situation would be for a court system that balances justice with trying not to let someone just “get caught up in the system.” From everything I’ve seen, I believe our court system does a good job of that. We’re better off looking at our societal problems that cause people to put themselves in court in the first place. It would help the story though if they don’t use drug dealers, felons who carry concealed weapons, habitual speeders (10 or even over 20 mph over the speed limit no less), violent offenders, etc as the examples. Getting your 4th speeding ticket for 20+ mph and having a criminal history that includes weapons charges and drug dealing does not scream “victim” to me. Disorderly conduct, minor drug offenses, traffic violations…I’m sorry but that type of behavior deserves citations. I agree with Ryan that fines should be tied to income to at least make it more fair and reduce instances of people getting trapped by the system for inordinately long periods of time. Policing also does need to be applied evenly to all areas, not concentrated in certain parts of the city. But the main point is that it’s not that hard to avoid these situations. Got a headlight/tail light out? You can change it yourself for only the cost of a bulb and thus avoid a citation. Hey you know what? Not driving in the parking lane also helps you avoid citations! If you’re poor that’s even more incentive to avoid getting tangled up in drug use/possession – the habit is expensive and the fines are expensive. One would think you’d try to avoid spending money you need for feeding your family on drugs. As for disorderly conduct…well you really do have no one to blame but yourself if you get a citation for that. There’s something about asking certain people to empathize with others that invokes anger. I’ve yet to find any correlation to this madness.